The castle dating back to 1172, is a superb four star deluxe hotel. Facilities include 8 meeting rooms, 111 uniquely designed guest rooms, an award winning restaurant, two unique bars and a stunning lobby. 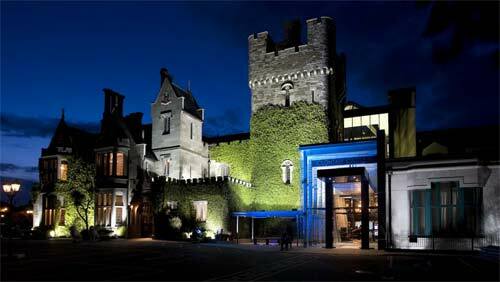 Clontarf Castle, reborn and redesigned, is the choice of interesting people the world over. Forget what time it is, Clontarf Castle is an imaginary world, no longer the past, not quite the future. When you arrive, time becomes….yours. Located in Dublin’s leafy Northside suburbs, Clontarf Castle Hotel is part of a privately owned Irish collection of hotels and is a stone’s throw from a city bursting with life, energy and vitality, history and history in the making. With turrets, tapestries and an ancient history, the thick Castle walls conceal a hotel interior that would not be out of place in Manhattan or Miami. A €10 million makeover has seen this Dublin Castle willingly leap from the 19th Century and land two feet firmly in the 21st. The ancient Castle walls hold firm the traditions of Ireland - a welcome as warm and grand as the Great Hall itself, its private grounds ensure a peaceful nights sleep. Rest, daydream or play. Serenity in the security of the Castle, underpinned by impeccable standards of service, and attention to detail. Dating back to 1172 Clontarf Castle which is steeped in history has maintained its original structure, while incorporating an internal modern design scheme. 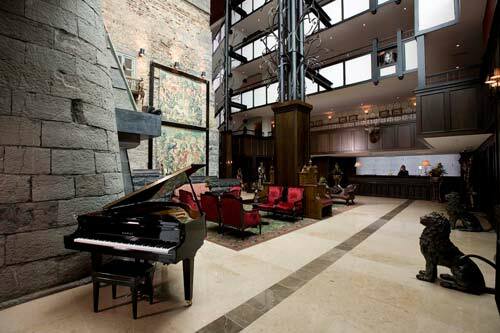 On arrival guests enter the new atrium style lobby which is the finest example of the merging of modern design with the Castle’s original features. 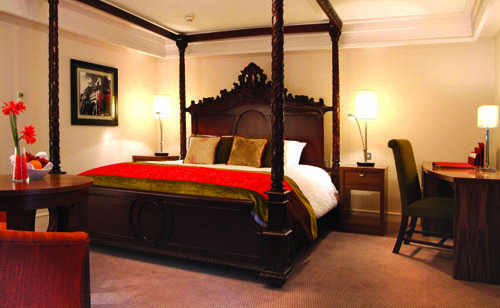 Clontarf Castle Hotel is located in Dublin’s leafy Northside suburbs just outside of Dublin ’s city centre on Ireland ’s eastern seaboard. The Hotel is two miles from the city centre and just five miles from Dublin Airport. When it comes to dining there is something for everyone’s taste at Clontarf Castle Hotel. The Knight’s Bar is firmly rooted in the traditions of the castle offering guests modern cuisine in time-honoured surroundings. The Indigo Lounge is an uber-chic bar that will rival the city’s top night spots! Lavishly decorated with rich colour, oversized sofas and chandeliers, the opulent lounge radiates elegance. Fahrenheit Grill is a new addition to the hotel’s culinary offering, specializing in steaks using dry aged Irish beef. Head Chef Jason Hayde serves classic dishes with a distinctly modern twist using the finest local produce in stylish surroundings. At Clontarf Castle Hotel, our 111 guest rooms and suites range from the luxurious to the truly extravagant. From the fashionable style and comfort in our deluxe bedrooms to the definitive in opulence in our individually designed executive rooms and suites, many with four-poster beds and views of the Dublin mountains. All hotel meeting rooms offer the latest technology, coupled with unobtrusive services, and create a unique and sophisticated environment catering for small functions to large conferences. We can provide facilities for a couple of people or a group of 600 people, while maintaining quality standards and a unique castle atmosphere. Our conference team can assist with organising a Cocktail Party, Gala Banquet, Business Dinner, Product Launch, International Conference or that Special Event you have always dreamed about. Your guests can dine in our range of restaurants and bars, or a wide range of creative menus can be tailored to your specific needs. Let our 12th century castle hotel in Ireland be the setting for the most important day of your life. Our unique castle wedding venue is the perfect setting for your magical day. As one of the most unique wedding hotels in Ireland, Clontarf Castle Hotel is set in idyllic surroundings, with a stylish and classic interior. Where else would you find a castle wedding venue that is close to Dublin city centre and Dublin airport, making the location perfect for your guests no matter from where they are travelling? The team at Clontarf Castle Hotel have outstanding experience in planning weddings. We don’t just help you plan the best day of your life, we know you have other things to think about, so we help take all the worry away. We can cater to all your desire, even some of your whims! From diverse menu planning and seating arrangements to working hand in hand with you on your floral arrangements, music choices and more, our staff can help make your wedding day dreams come true.